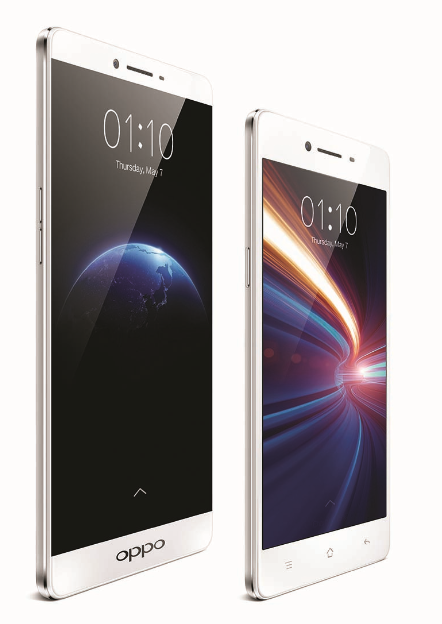 Oppo R7 and R7 Plus are official! Oppo, the rapidly rising Chinese smartphone manufacturer, has today confirmed two new upcoming releases, the Oppo R7 and the Oppo R7 Plus. There have been tons of rumors about the Oppo R7 as bezelless concepts filled the internet over the past few weeks. People were expecting to see the Oppo R7 this Spring as one of the most bezelless smartphones ever, as the concept renders that were leaked showcased a virtually invisible bezel on both sides of the phone. The new Oppo R7 images released by the company debunk the bezelless look, although not in its entirety. The renders published by Oppo showcase a rather stylish phone that doesn’t have the rotating camera mechanism that made the company famous last year. 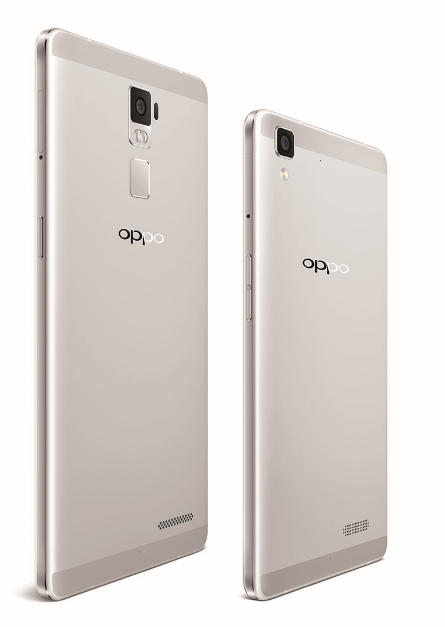 The Oppo R7 and Oppo R7 Plus bear some design elements which are iconic to the company and we have seen them in the Oppo R5 previously. The new flagship devices boast with a still bezelless design that is easy on the eyes on both variants and the phones use a 2.5D glass which gives them the aspect of bezelless smartphones. According to Oppo, the 2.5D glass panels on the front of each device will give the illusion of bezelless smartphones, which is mostly enough for our eyes at least. When it comes to Oppo R7 specifications, the company hasn’t released too much, but enough to get us going. The Oppo R7 Plus is the more handsome of the duo, as it has thinner bezels on the top and bottom and looks way more sleek than the regular Oppo R7 does. It’s also the larger variant with a larger display, so as to cater to the recently popularized phablet trend which Apple has started off last year. Taking yet another page from the Apple book of smartphones (and more recently, the Samsung book, too), the Oppo R7 and Oppo R7 Plus embrace the metal unibody design, which suits them very well indeed. The Oppo R7 display, being the smaller one, will be a 5 inch FHD resolution one, although these details are not yet confirmed by the company. Smaller and less powerful, too, as the Oppo R7 gets an octa-core Snapdragon 615 CPU, 3 GB RAM and 16 GB internal storage. The smartphone will be available in two different variants, though, another one sporting a MediaTek CPU, this variant surely being the Asian and maybe European version of the phone. The Oppo R7 camera on the rear will measure 13 MP, so it’s bound to be as good a phone as any in the saturated market right now. Oppo does cameras very well, so we’ve high expectations from the R7. When it comes to the phablet, the Oppo R7 Plus, it will most likely be the more powerful and more expensive version. If will sport a 6 inch QHD panel on the front, which means it will be able to compete against beasts like the Samsung Galaxy Note 4, Galaxy S6 and even the LG G4 if the price is right. It will also boast great performance, according to Oppo, and rumors point to a high-end MediaTek processor backed by 3 GB RAM and 32 GB internal storage. The camera will also get a bump compared to the Oppo R7, as rumors say it will be a 16 MP sensor complete with laser autofocus and maybe even optical image stabilization. The Oppo R7 release date, and the Oppo R7 Plus release date for that matter, is set for May 20 this year and Oppo has already released quite a few teasers to start promoting the new device. We are looking forward to finding out more about the new Oppo devices, as the company has repeatedly impressed fans since the Oppo Find 7 was launched. You can check out an Oppo R7 video if you go YouKu, but we’re sure that the renders that the company has already released are pretty much sufficient to get an impression of the new devices. We will keep you up to date as soon as Oppo confirms the specs for the new devices. Zeblaze Watch Promotion on Gearbest!